This past week, we have pushed real hard to clean out the garden. 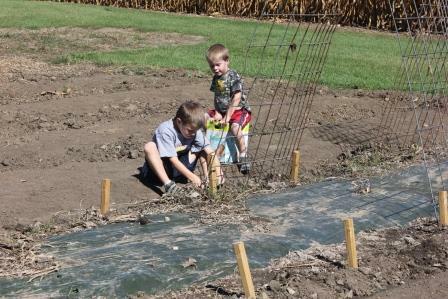 We worked to finish harvesting certain vegetables, take the trellis’ down and put away, mulch the plants and till the garden. The boys were great help. Keith received a promotion of sorts and was given his first jack-knife and helped cut string. He was very excited about this new-found responsibility. As we gathered around the table tonight, we discussed what we liked most out of our garden. Answers ranged from popcorn to potatoes and squash to lettuce and onions to sugar snap peas and green beans. The good news is for the most part we are growing what we enjoy eating, and we hope that we are also growing what all of you enjoy as well. The surveys indicate that we are. Thank you to everyone who has returned the year-end surveys. Your feedback is extremely valuable input to ensure that we are providing what your families enjoy eating. We also discussed our family harvest feast. I have decided that this weekend we need to have a family feast containing items grown in the garden. The boys deserve something fun to celebrate all of their hard work, and what kid doesn’t like a “party.” I don’t know that it will be quite the well-balanced meal I usually serve, but it should be fun. 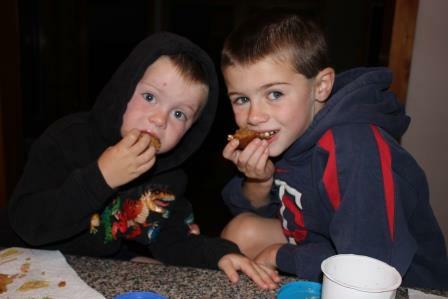 Their ideas for food included pumpkin pie, lefse and onion rings. I will let you know how it goes. Even thought we still have popcorn to deliver to all of you in the upcoming weeks, it is fitting to say a big THANK YOU to all of you from all of us. We have greatly enjoyed working with you and for you and sincerely appreciate the trust you have put in us to provide your family with fresh produce. We really do enjoy our visits with you and the opportunity to see everyone learning from this opportunity. We harvested the strawberry popcorn this weekend. It appeared the raccoons were starting to enjoy it. We husked the white popcorn and decided it along with the blue popcorn need to dry down some more. Interesting to note that the ears are so much larger than the strawberry popcorn. Also, the blue popcorn was able to catch up in plant height even after being planted about a month later than the other varieties of popcorn. Also, the blue popcorn had pollination challenges due in part by the weather. By pollination issues, I mean that the ear of corn is not filled out with kernels. 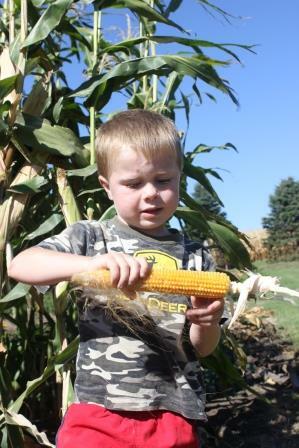 Learn more about corn pollination here. It really is quite interesting! All the potatoes are dug! I always find this to be a treasurer hunt. 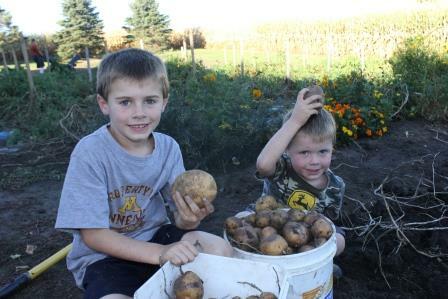 You never know how many potatoes you will find or what size they will be. To me, it simply is one of the most exciting parts of gardening. So excited to find the Masquerade potatoes. Reminder please return any cups or plastic containers and your box. We will connect with you when the popcorn is ready. You can either return it before then or at that time. Remember food safety in your kitchen when preparing, always wash your produce before eating. Please fill out and return year-end survey which was sent to you via email this weekend. Your feedback is greatly appreciated! Black Seeded Simpson Elite Lettuce – One of my favorite garden crops. Quick fact video about lettuce from America’s Heartland. Beet leaves – Some young beets are available. Spinach – a taste for you. It finally grew this year! I think it was our fourth try. Tomatoes – Fourth of July (medium size red), Black Krim, Big Boy, Brandywine and super sweet cherry tomatoes 100. Check out how tomatoes are grown hydroponically. Peppers – They are plentiful this year. Here are a few recipe ideas. Onions – A few fresh onions to put in a recipe here or there. I think we will give one of these recipes a try for homemade onion rings. An interesting video on onion harvest in Idaho and food safety. Green Beans – Enjoy the Providers – 1/2 of you received them last week and 1/2 this week. Sugar Snap Peas – 1/2 of you received them last week and 1/2 this week. Did you know that Minnesota is the largest grower of peas for processing – producing more than any other U.S. state each year? Potatoes – This week’s box contains Yukon Gold, Masquerade, blue potatoes and Norlands (red potato). Butternut or Carnival Squash – Butternut is a favorite for many. Carnival is a decorative, gourd like squash with a nutty flavor. It is a hybrid of Sweet Dumpling and an Acorn squash and has a shelf-life of up to three to four months. See recipe below as another way to use this vegetable. Herbs – Cilantro, parsley, golden oregano and rosemary. Don’t forget to wash and freeze these in ice-cube trays – great for soups later this winter. Fresh cut arrangement – Sedum, Enjoy these as a fresh or dry arrangement. Something most of you may have in your garden, but more than likely don’t take the time to bring them inside. Hope they bring a smile to your face. This is a favorite in our house. Super easy to make and super moist bread. Enjoy! Preheat oven to 350 degrees Fahrenheit. Begin recipe by combining the dry ingredients: 1 2/3 cups flour, 1 1/2 cup sugar, 1/3 cup butter, softened, 1 teaspoon soda, 1/2 teaspoon cinnamon, 1/4 teaspoon nutmeg, 1/4 teaspoon cloves and a pinch of salt. Next, I have already thawed out some of my frozen squash. 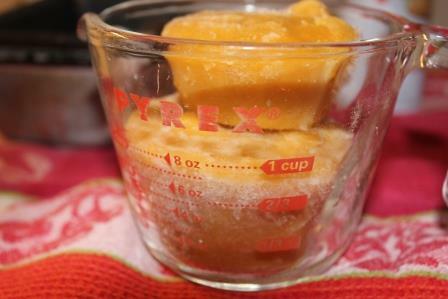 1 cup canned pumpkin/squash, and 1/3 cup cold water. Mix. Simply love using the variety of eggs from our chickens. 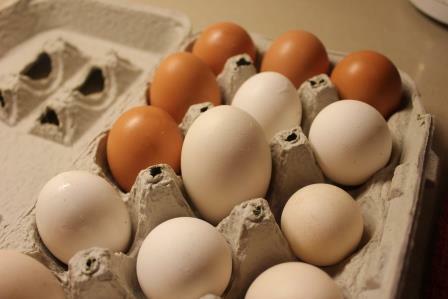 Did you know that hens (female chickens), once mature about 4-5 months old, will lay about one egg every 24-26 hours. They will begin by laying smaller eggs. As they grow older, they molt (lose feathers). During the molting period, their body rests. And then they grow their feathers back and begin laying again. Laying a larger egg then they did before. This is a cycle, and how we get pee wee, small, medium, large, extra-large and jumbo sized eggs. I bake mine in smaller loaf pans. Bake for 1 hour at 350 degrees. Take out of the oven. Run a knife around the sides of the pan and tip out onto cooling rack. Enjoy! 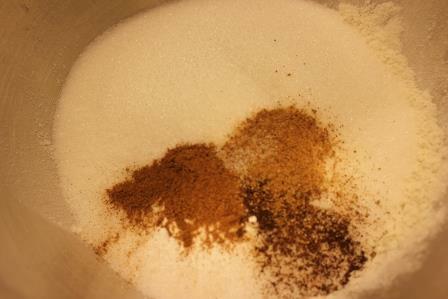 Combine flour, sugar, butter, soda, spices and salt in a bowl. 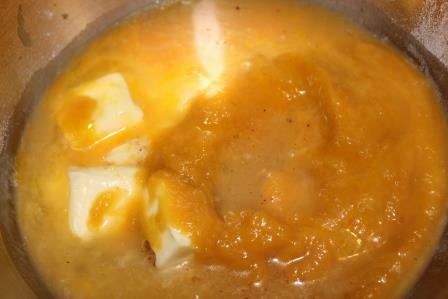 Add 1/3 cup cold, eggs and pumpkin; mix well. Pour into greased loaf pan. Bake at 350 degrees Fahrenheit for one hour. Cool on wire rack. The boys love this bread. 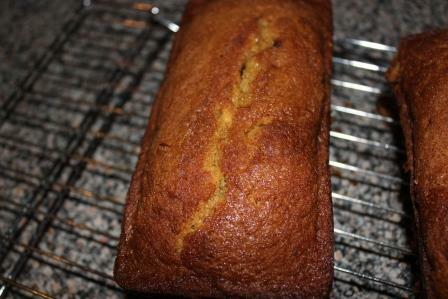 It really is delicious right out of the oven and for a few days after you bake it (if it lasts that long)! 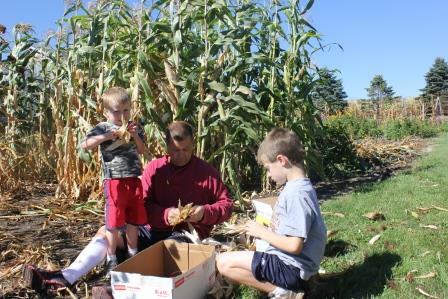 This entry was posted in Uncategorized and tagged butternut squash, buying local, CSA, factory farms, family farms, farming, food, Gardening, gardening with kids, herb gardening, kids in the garden, local foods, Northfield, rhubarb, vegetables. Bookmark the permalink.